Continuing the theme from previous blogs, this post completes the Assessment of Climate Change in the Southwest U.S. blog series with another perspective from one of the coordinating lead authors of the chapter on adaptation and solutions, “Climate Choices for a Sustainable Southwest.” Susanne Moser, the Director and Principal Researcher of Susanne Moser Research & Consulting, is a leading expert on adaptation, science-policy interactions, decision support, and climate change communication. Below she gives her opinion on the same questions we’ve asked the other authors in this series. What do you consider to be the most dreaded or threatening impact(s) to the SW region, and how might they affect the average citizen? Moser: I am not sure it's overly useful to think about just one threat that cuts across and is pertinent to everyone in the region in terms of dread or threat. Psychologists tells us that we experience the greatest sense of dread with things that come unexpectedly, are truly terrifying, and that we don't have much if any control over. So the folks in Oklahoma City who had a massive tornado barrel through their part of town may have experienced quite a bit of dread. My sense is lack of control is probably the biggest factor. 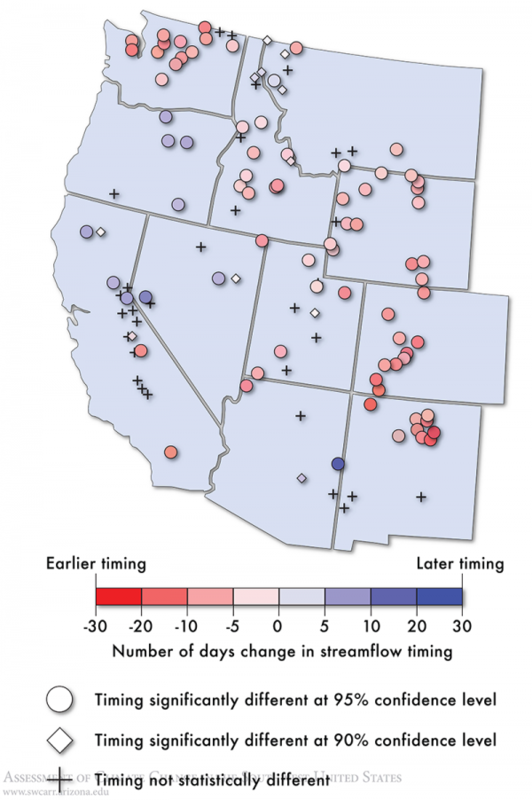 Changing streamflow timing 2001-2010 compared to 1950-2000. Differences between 2001-2010 and 1950-2000 average date when half of the annual streamflow has discharged (center of mass) for snowmelt-dominated streams (Steward, Cayan and Dettinger, 2005). From Assessment of Climate Change in the Southwest, Chapter 5. Now take the Southwest Climate Assessment—it makes a big point about the region as a whole becoming drier both because higher temperatures will dry out soils more, and our snowpack will melt and run off sooner (see figure, left), but also because there is a good chance the region will get less rain and snowfall overall. That is definitely a big threat for a region that’s already dry, with lots of people vying for those limited resources. But it becomes a dread only if you ignore the warnings now and don't reduce the causes of climate change, and don't prepare for longer dry periods and their impacts. So if you are a water manager with a big, deep reservoir, these projections may worry you less than if you are a relatively small rancher or farmer with only junior water rights—you simply don't have as many choices to prepare for the impacts of a drier climate. So, to you, this could be rather dreadful news. 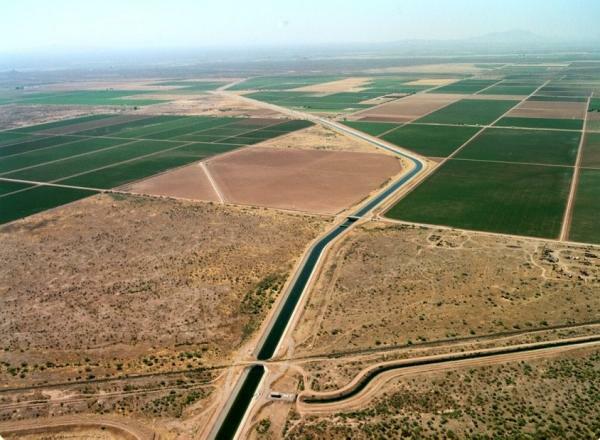 Many Arizona farmers depend on irrigation water from the Central Arizona Project (CAP), but climate change could reduce flow on the Colorado River, CAP’s water source, an impact that could trickle down to farmers as well as metropolitan water users. Source: U.S. Bureau of Reclamation. And so we can look to every sector—water, agriculture, forestry, coastal areas, public health; to every part of the Southwest—the mountains, the deserts, rural and urbanized areas; and to different sets of decision-makers—business leaders, city planners, firefighters, county health departments, tribes, port engineers, parents, what have you—and for everyone the set of threats, and what are truly dreaded impacts will be different. Our challenge is to help people see what the threats are, and what options they have to deal with them, and if possible expand those options and help people implement them so that we reduce the amount of paralyzing dread. What is the biggest barrier, and greatest opportunity, for dealing with these impacts? Moser: Again, that depends on who you are, what decisions you make, in what region or sector you find yourself. In one study I was involved in in coastal California, we found governance barriers to be the biggest challenge for local officials—the constraints that arise from the fact that we have institutions and procedures set up in ways that suited the climate and situation of the 20th century, but that are not dynamic and adjusted enough to fit the rapidly changing climate of the 21st century. And of course lack of funding or constraints on how available money can be used also pose big barriers. Interestingly, though, the next biggest barrier was about attitudes, about people's mindsets. To me, that means that to deal with the changes that are coming takes good leaders, people who are willing to make things happen even though they are hard, people who understand that we're in a critically urgent situation and who have the mindset that we will rise to the challenge. It's like the Chinese proverb goes: "Anyone saying it cannot be done: get out of the way of the people doing it." In our study we found people like this again and again, and it's giving me hope that we can deal with the impacts of climate change before they get catastrophic. What do you wish your local or regional decision-makers would focus on, in order to deal with climate change challenges? Moser: Three things: (1) Think not just short-term, but take your public interest mandate seriously and consider the longer-term as well. (2) Think and act not just within your (limited) area of responsibility, your most immediate mandate, but always seek the points of connection to other issue areas. That way we will solve our problems more systemically, not in a piecemeal, disconnected fashion. Nothing in life or nature is disconnected from anything else, just the way we try to think and deal with them. And I dare you: look at the world—how well has that piecemeal fasion worked for us? And (3) Be courageous. Nothing worth doing in the face of a planetary emergency can be done with small-minded, small-hearted approaches. Connect with allies. Find a way to break down barriers to "enemies"—find a way to work together. Speak the truth, and follow through so you have integrity in what you do. People will gather 'round such leaders. It's the people we find inspiring that we will follow. And so, you will get the support you need to push the tough things through. Sure, some will not like it (or you). But truth and integrity are magnets. We need courageous leadership. What do you view as the most surprising or significant NEW result from your chapter since the 2009 National Climate Assessment? Moser: I contributed to two chapters in the SWCA. In the coastal chapter (ch.9), we have a lot better information now about what coastal professionals can do, what they are doing, and what gets in the way for them in terms of preparing more for the impacts of a rising ocean level. So, knowing that helps scientists produce more decision-relevant science, but it also helps higher-level policy-makers to develop supportive policies and mechanisms to help local folks adapt to climate change. In the solutions chapter (ch. 18), we looked region-wide at all the ways in which we can (and already do) reduce the causes of global warming, and prepare for those impacts that are already occurring or that will still unfold because of the momentum behind climate change. Even if we stopped all emissions tomorrow—all over the globe—the warming and changes in the climate would still continue for several decades, so we simply have no choice but to deal with the continually unfolding effects of a warming planet. In the 2009 report, we simply didn't have much information on either the mitigation or the adaptation side at all. We show how big the challenge before us really is, how we have no time to waste and postpone dealing with the problem any longer if we want to have any chance at doing our fair share in reducing these heat-trapping emissions. But we also put meeting that challenge into the context of how early settlers of the Southwest have made tremendous changes to the landscape, how we were able to think wisely and with foresight in terms of preserving the natural riches of this region. Oh, and not to forget, how our Native peoples have lived here for thousands of years and eked out a living and thriving culture in sometimes rather inhospitable environments. We give a number of examples of how people in every state of the Southwest, at every level of government and in the private sector, are leading by example. So, while we concluded it's a big challenge we have before us, we also feel it can be done. We can do it! What are you most interested in learning more about next? Moser: Personally, I am most interested in some of the bigger, transformative changes that we quite likely need to tackle, both in terms of our energy and transportation systems (i.e. on the mitigation side) and in terms of adapting our ways of life, where and how we live, to the changing climate. The incremental small steps will only take us so far. There will likely come a time when we need to think bigger in terms of solutions. We don't know much about that yet, and I think it's not only interesting, but a moral obligation that we in the sciences get on the ball and have some answers when people come to us for answers some years from now. It's not enough for us to just study what is happening as it's happening. We should have some well-thought out solutions, developed together with stakeholders (not on our own! ), that can be implemented when people wake up to the royal mess we've created for ourselves. I anticipate people will get creative and be able to come up with good solutions, but if we don't think some of these big ideas through now, we could face even more havoc and lots of very unhappy people. To me, doing science that will serve us living on this planet—or even just in our small corner of it here in the Southwest—in a peaceful, satisfying and environmentally sane manner is science worth doing. *For more information on the Assessment of Climate Change in the Southwest United States, including a full-color pdf of the book, how to order a hard copy, and two-page fact sheets of each chapter, see www.swcarr.arizona.edu.